Who: All ages are invited. You do not need to be a resident of Fall City to attend. 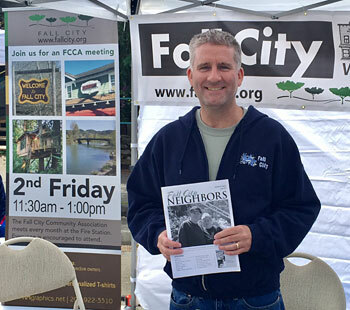 The purpose of the event is to introduce Fall City residents to the variety of service and special interest organizations available in the Snoqualmie Valley. The event is also designed to help people meet others who share a common interest. This is a casual, come-as-you-are event to look around and meet people who share your interests. Anyone interested in learning more about the community, engaging with King County and learning about the variety of service organizations and interest groups in Fall City, should attend. You may be surprised at how many special programs, information resources and unique opportunities are available to you. You will learn about special programs which are available to you at little to no cost. You can meet people who share your same interests. It will be casual, relaxing and no one will be selling anything. Do I have to be a Fall City resident to attend? No. All are welcome although the focus of the event is Fall City. Is the library big enough? The entire library space will be used for this event. The event will not be limited to the community room in the back. How can I get invited/how might I participate? Note: Space is limited and the event may be full. Is selling of goods allowed? No. No selling is allowed outside of membership fees, dues, donations or similar. How is it possible to have food/snacks in the library? Pre-packaged foods will be allowed during this event and may be handed out by participating organizations. Organizations who are approved in advance and also have a food handlers permit may be allowed to serve additional food types. It is expected that any food items made available will be easy to clean up and be considerate of the library environment. What organizations are being invited? The list below represents organizations that have been invited to attend. Please note that it is very likely that some of these organizations will fail to appear and no guarantee is made that all organizations will appear. What sort of space is available? Participating organizations will be limited to a maximum of a 10�x10� space and smaller exhibit footprints (such as 8�x8�) are encouraged. Your flexibility is appreciated as the entire library shall be used for exhibit space and there are many asymmetrical spaces. What other concerns should we be aware of? The event space will potentially be very noisy as the overall space is small. Available space is limited and organizations will be spread throughout the entire library, thus some exhibitors may be located amidst stacks of books, along walls or back-to back with other exhibitors. You may not use a PA system or amplify audio beyond the max. volume of a normal laptop, PC or projector. Liquids (other than drinking water), fans, fire, smoke or aromatics may not be used in your display. One or more persons to set up and �work� in your area for the duration of the event. A sign, display, banner or similar materials that identify your organization or space. A table or similar surface to display brochures or other materials. One chair (have on hand as a backup). A power cord at least 20 feet long (if power is required). Something of interest or something for distribution to all ages. Visitors always like handouts. This is a casual, indoor event and casual attire such as jeans and t-shirts are welcome. Community residents would appreciate if you wore a name tag or identifying article representing your organization, but this is not required. When can we set-up or load in? You may begin setting up or loading in at 9:30am and continue until the event begins at 11am. The library does not open on Sat. until 10am. When can we load out? Load out may begin at 2pm when the event softly ends, but exhibitors�at their discretion�may remain set up until 3pm if desired. Likewise, if traffic falls off early, exhibitors may leave early. This is supposed to be casual. I have more questions. Who may I contact?